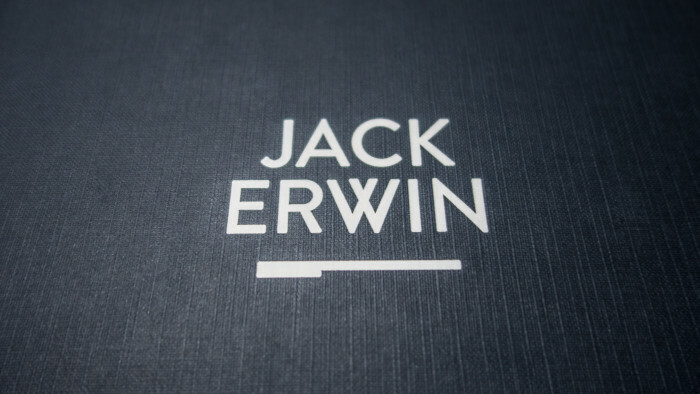 Jack Erwin is a shoe company started by two best friends tired of not being able to find shoes within their budget. Co-founders Ariel Nelson and Lane Gerson’s struggle was transformed into a line of simple and cleanly designed dress shoes at affordable prices. 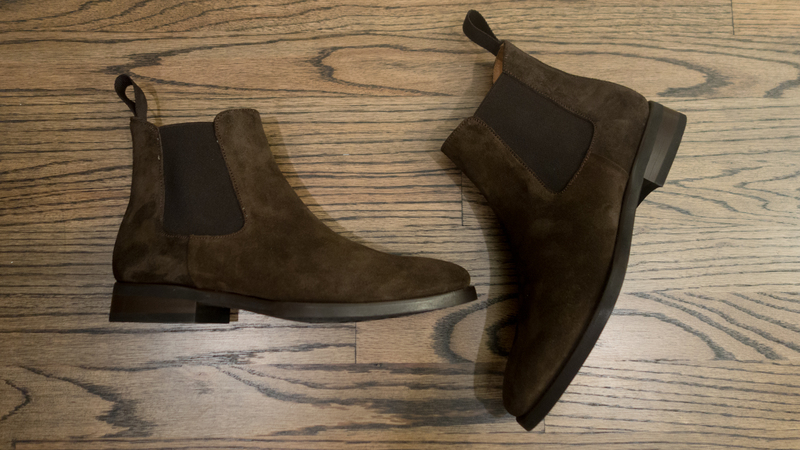 Foster – Blake-stitched soles with a tapered toe box priced from $195-220. Sullivan – Goodyear-welted soles with a rounded toe box priced from $195-220. Wright– priced at $175 for a bologna constructed leather penny loafer and $95 for suede driving loafers. 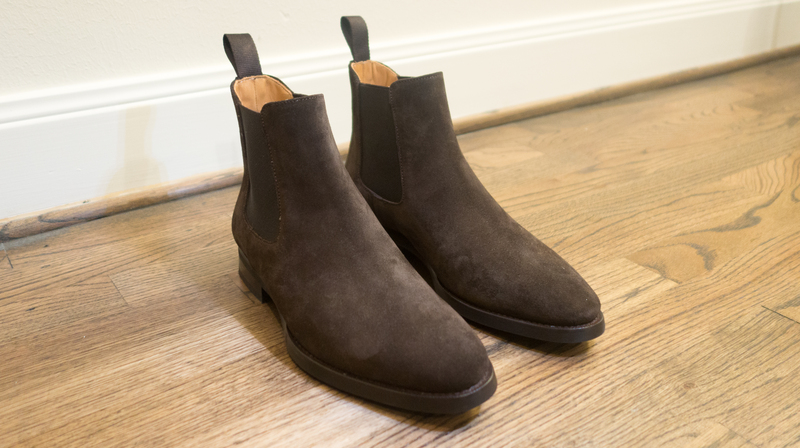 Jack Erwin provided a pair of Ellis brown suede Chelsea boots to Something Bespoke for an unbiased review. While it’s recommended that you select your normal US shoe size, one problem I found is the shoes fits quite large. Jack Erwin sent me a size 7 but for reference here are a few shoes I own in other sizes. 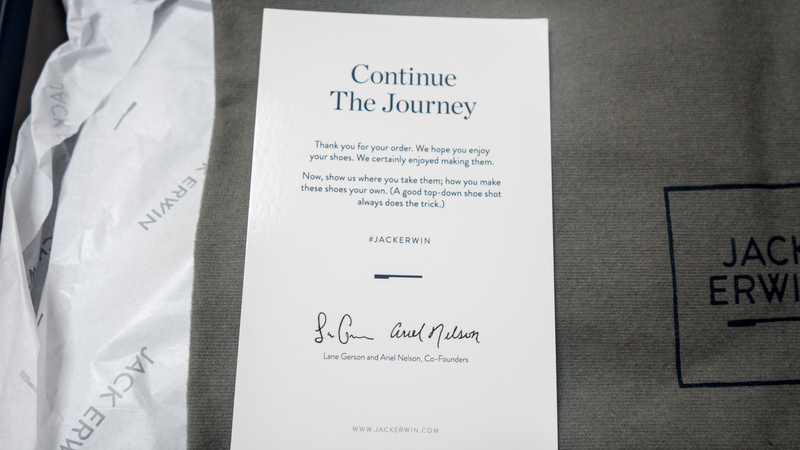 Our personal recommendation is size down one size from your usual dress shoe size. Inside a large shoe box, the boots come wrapped in tissue paper and plastic. A shoe bag is also provided for storage. As I opened the box, the first thing I noticed about the shoe is the sole. 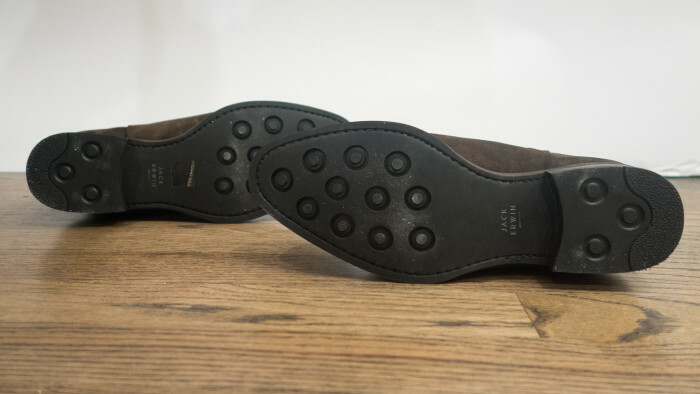 Studded rubber outsoles are used to prevent slipping in wet weather and normally wear slower than leather soles. Rubber soles can also help reduce creasing of the upper. Philip’s first impression of the shoe was “Dang, this is a really nice boot” followed by “Hmm, they are pretty comfy out of the box too”. The Ellis boot itself is constructed in Spain using leather sourced from a French tannery on the Foster Blake constructed last. 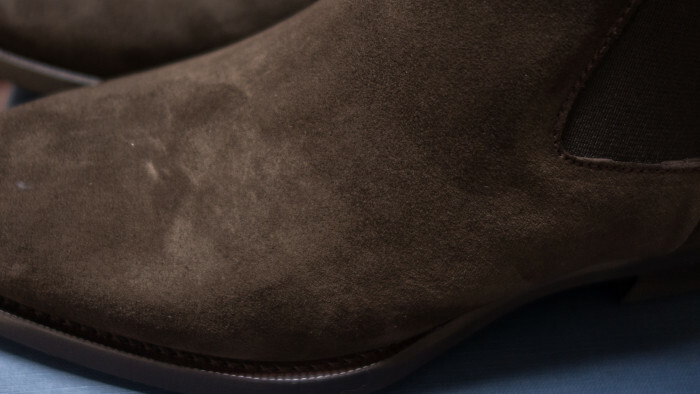 Jack Erwin uses 100% suede for the upper which at first touch is soft but a little stiff which should loosen up with a few wears. Phillip described the shoe as comfortable to wear all day but slightly tight around the side of his toe on the very first wear. The shoes showed very little signs of creasing after five wears over the course of a week. Because Phillip works in an office setting the leather will still require a bit more wears to break in. The leg opening on a size 7 is approximately ten inches around so I do not recommend this boot if you are looking to wear with skin tight skinny Saint Laurent jeans (My SLP Chelseas have approximate nine inch opening) but the Jack Erwin Ellis is an attractive option at an affordable price for those looking to add a Chelsea boot to their wardrobe. 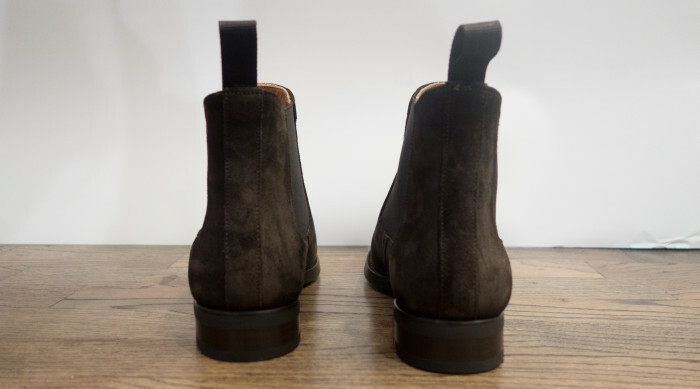 The Blake Construction allows for the shoe to be resoled which is a great thing considering many boots in this price range do not offer that option. 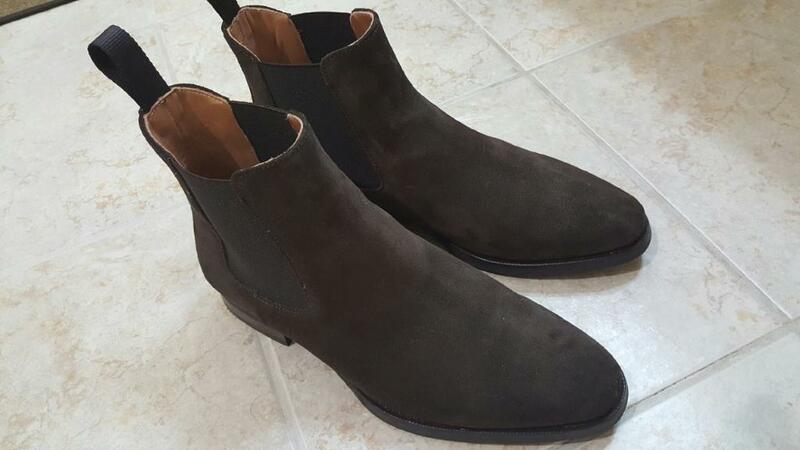 Suede Chelsea boots are a solid addition to a business casual and casual wardrobe and with Jack Erwin’s free shipping/ free returns there is no harm in giving the boots a shot. 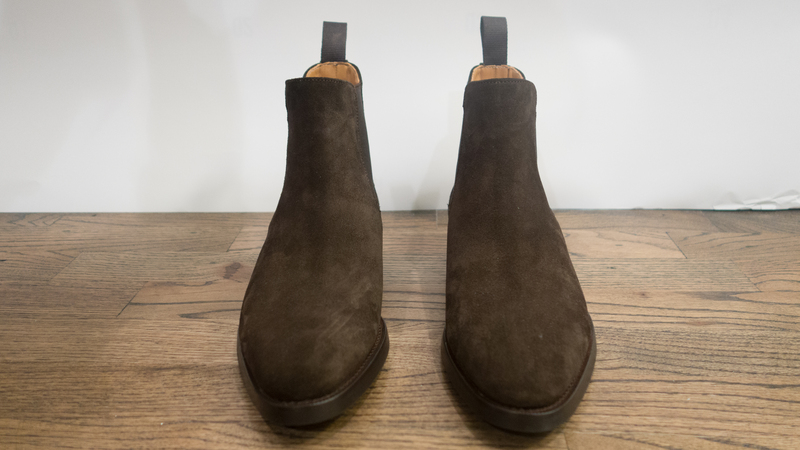 We would like to thank Jack Erwin for the opportunity to review their new Chelsea boot. 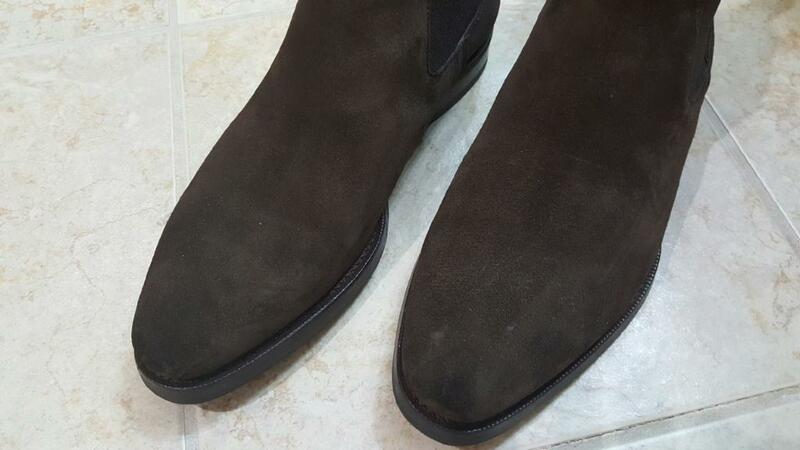 A link is provided below if you are interested in more information about the boots.